Did you know that the original monopoly game we loved as kids was based on actual streets in Atlantic City? The board game has emerged with various renditions; timeless, reinventing, and still widely popular, just like Atlantic City (AC) itself. On the corner of Mississippi and Boardwalk, the Historic Atlantic City Convention Hall featured stars of yesteryear like Frank Sinatra. Renamed the Boardwalk Hall, Janet Jackson will kick off her new Unbreakable World Tour in March and coming this year are Madonna, Celine and Ricky Martin following the return of the Miss America Pageant to its roots after a decade in Vegas. We can’t imagine the machinations involved in pulling off such a complex pageant of that many women. Its numerous events in one make AC the event capital of the country. You can make it your AC with Mike Charlton’s new website www.AtlanticCityYourWay.com He is Mr. Tourism for the average Joe, focusing on the golf niche, then bachelor and bachelorette parties, (a biz he describes as insane) and is now engaged in revitalizing the shore destination. We joined him at the Irish Pub on St. James by car, not by thimble or shoe. Joe DiMaggio always stayed in room 101 upstairs and his booth is labeled downstairs in the bar. Every nook and cranny of the restaurant and inn is filled with old time photos, fun and food – all comfort food such as the phenomenal shepards pie and so affordable. The bill for three for dinner and drinks totaled $55. The economy of AC is not failing, it is adjusting like a come back kid. In case of kids and in case of rain, coming soon will be an indoor Water Park, repurposing The Atlantic, which was once the Golden Nugget. Since the return of the famous diving horse is prevented by PETA, the Park will make a big splash instead. 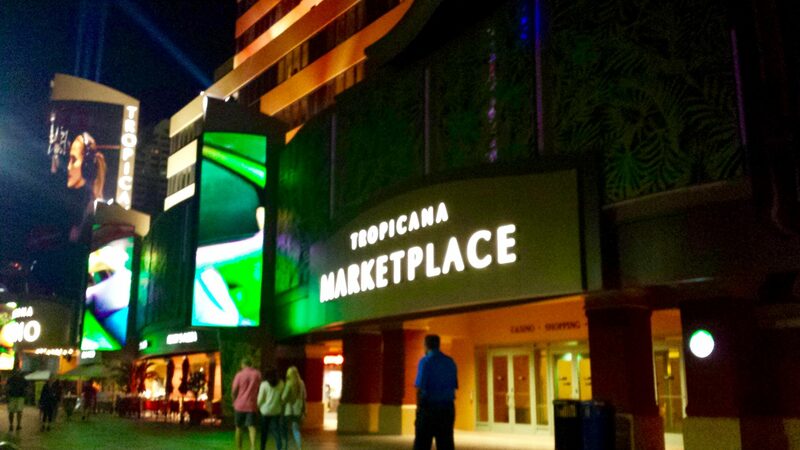 From casinos on the boardwalk to boating and golf, people love to game on in Atlantic City. It is a city of firsts in history for many things. 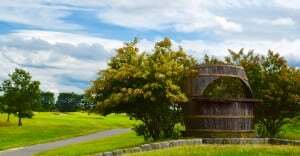 The Atlantic City Country Club is the birthplace of the birdie as well as our writing career. We won the qualifier here in ’08 and represented the US in St. Andrews in the International Pairs competition, against mostly two men teams from around the world. We tied for 6th, were asked to write the story and then were offered a column in New England Golf Monthly, which we’ve written ever since. Donning ourselves Couple of Travelers, we created our websites, expanded to additional outlets and the rest is our history making this trip special, reliving the feeling of some of the holes. 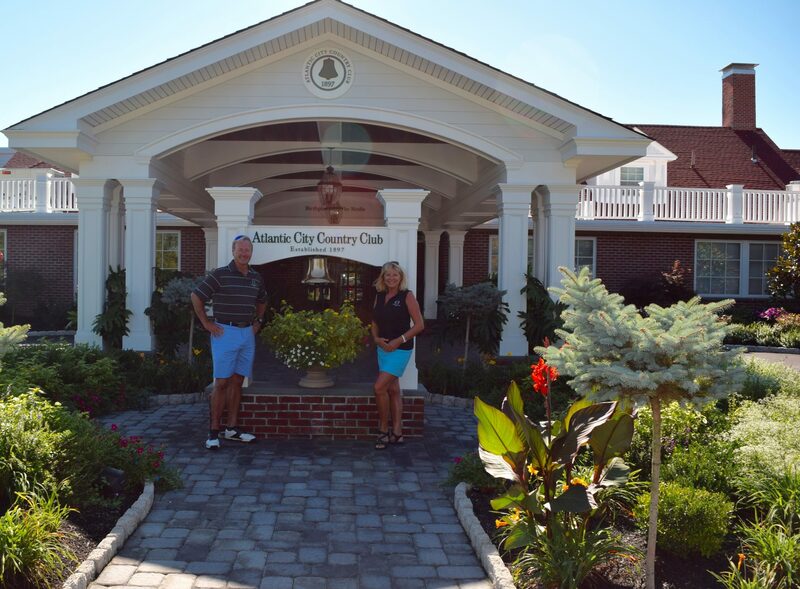 As we entered Atlantic City Country Club, it rang a bell. Indeed its iconic symbol represents the bell, which tolled for the last trolley back in the day that came down Shore Rd. over the bay before it might be delayed because of high tides. The bell used is on display at the club entrance and tee markers are shaped as such. The first tee box is uniquely a continuation of the practice green. We fondly recalled the family of foxes frolicking on number 6, but they were elusive this time around. The Ottinger group purchased the Club, renovated parts of the clubhouse and renewed the course to a high standard of play. They are compiling clips for a video and all that is lacking are “the beauty shots including the foxes” that are sly, shy, and avoiding lenses. 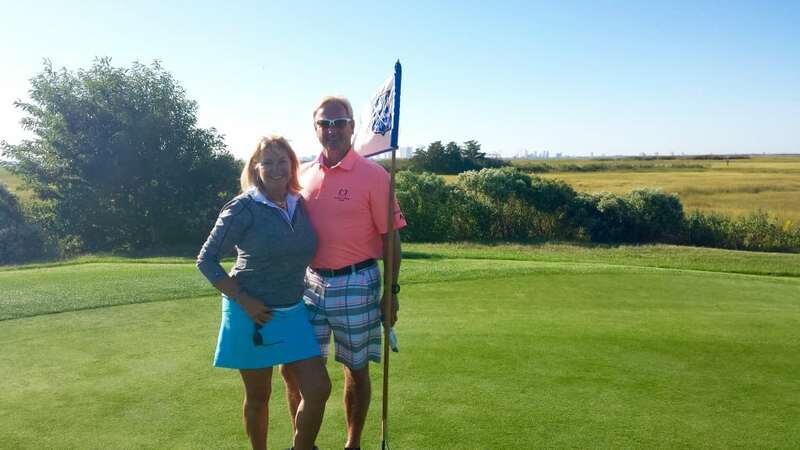 Views of Absecon Bay and the AC skyline loom large throughout the course as on number 14 which we remembered was the “go for it” hole in the qualifier. It was our first time scoring Stableford and we did not think we stood a chance but had ham and egged it enough to be draped in the American flag and blue jackets that evening. Needless to say, we will always love Atlantic City Country Club. 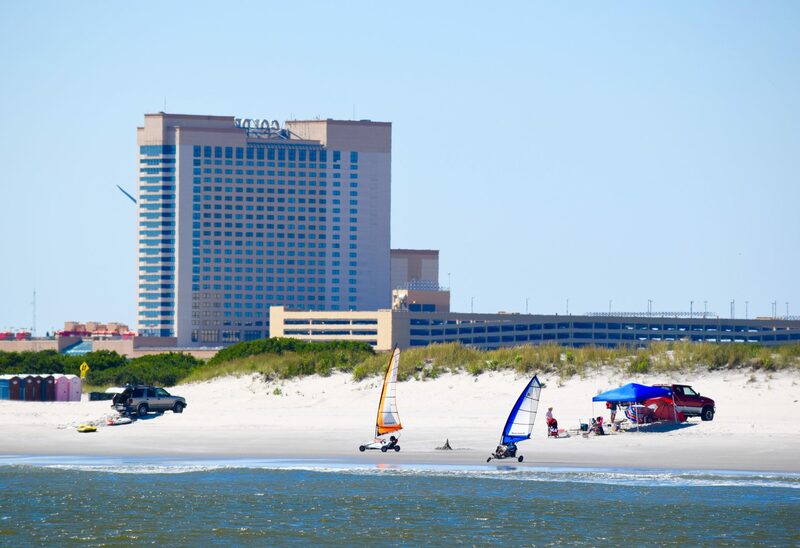 AC is a shore bet for golfers, gamblers and water lovers. The boardwalk extends to the sandy beach, where Miss America makes her traditional jump and did so the day we arrived. “Sea” your way to Gardner’s Basin for the village of shops, restaurants, aquarium and the Atlantic City Cruise. 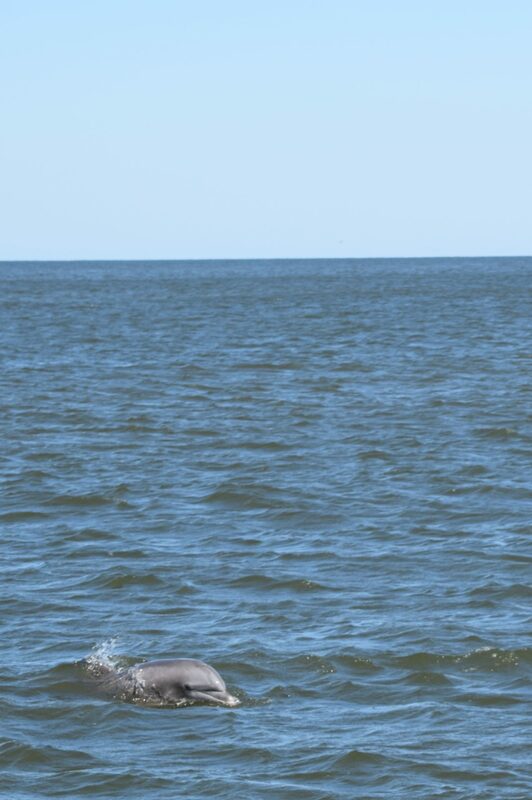 Hop on the 1pm dolphin tour and siting is guaranteed or you receive a coupon for a return trip, no expiration date. Captain Jeff scouted ahead on his own speedboat while Captain Ken and first mate Chad who also moonlights at the Honda Classic at PGA National in the winter, chartered us. 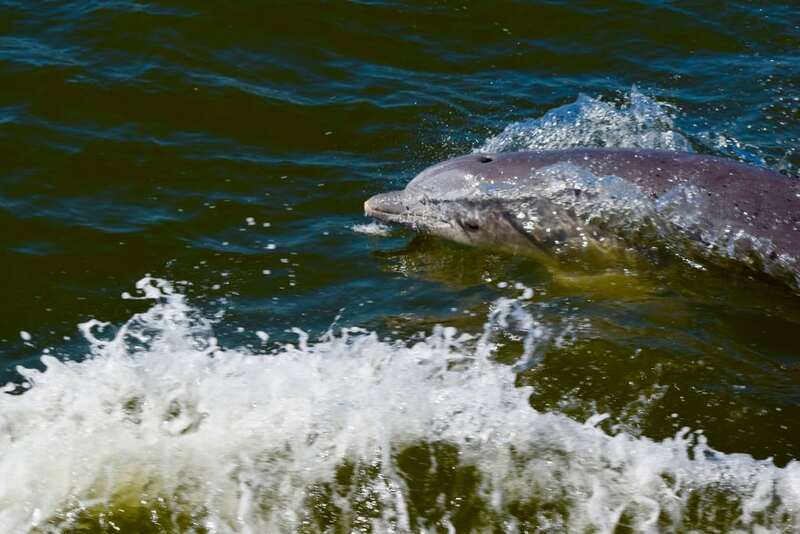 We hit the jackpot with over 100 bottle nosed dolphins emerging, perhaps a record. 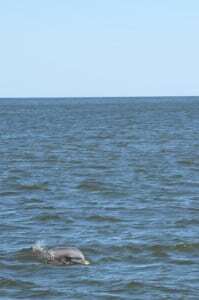 Babies are black, graying into adults living to be 50, often dying because of teeth decay and not able to then fish. They all looked healthy and happy to us playing in and out of the water on a sunny day as passengers squealed with delight. 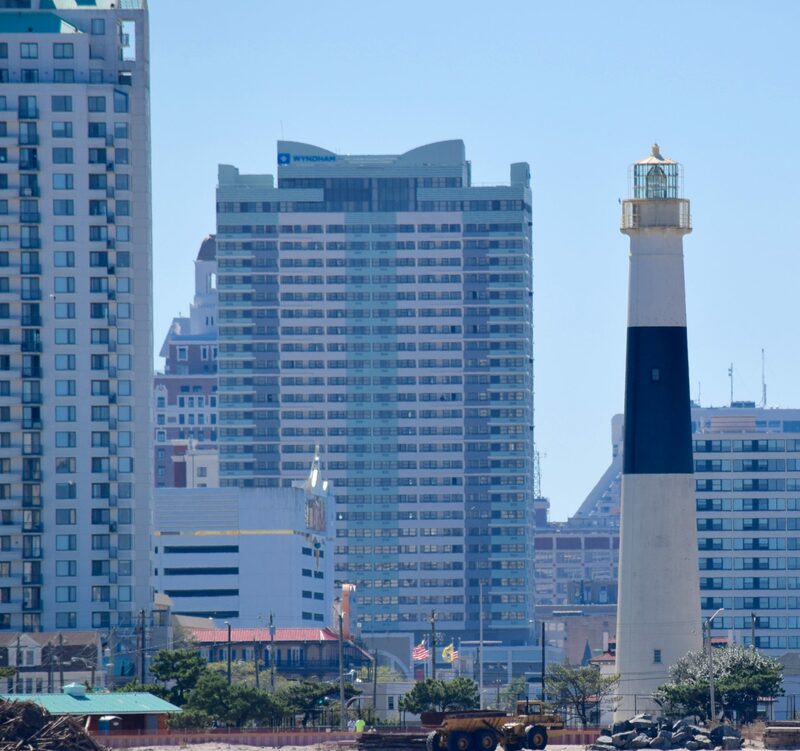 The backdrop on the cruise is always stupendous including the Casino beach row and Absecon lighthouse, the tallest in NJ and third largest in the country. Along the beach of Brigantine Island, sail carts were racing, a first for us to see. 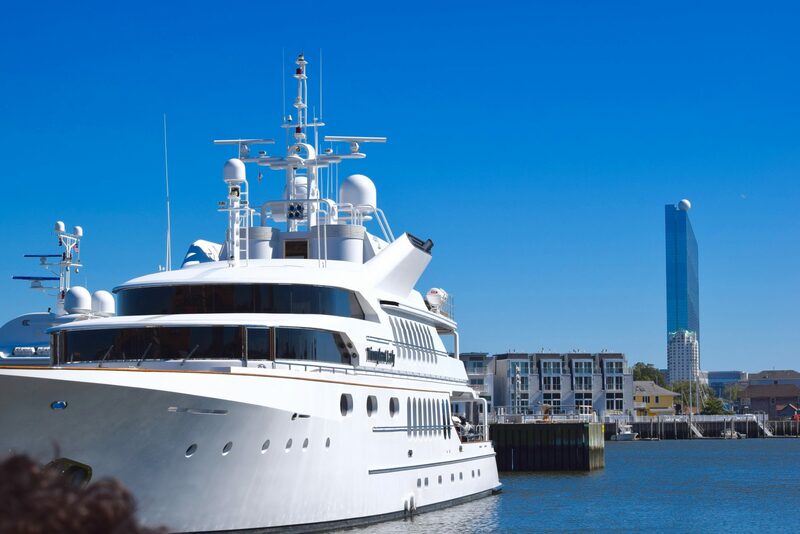 And in the marina the multi million-dollar ship, Triumphant Lady stood out against the Rebel Casino whose owner purchased the vessel from Judge Judy. The Revel has a gigantic golf ball on top but is not open and not for lack of funds, but due to a conflict with the power company that was housed within. He thought he landed on the Electric Company and took a Chance…. From Baltic Avenue to Pennsylvania, Boardwalk and Parkway, around the board, pass thru the casino and collect $100 if you’re lucky. There are eight casinos today and that is plenty of entertainment. 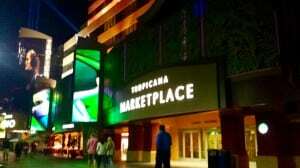 We stayed at The Tropicana, modeled after Old Havana, it is really a beach village unto itself with lots of shopping and many restaurants from snack shops to PF Chang, Carmine’s, an Irish Pub and Cuba Libre. It’s like a Miracle Mile within the hotel and a beach resort on the outside. Lounge by the pool or on the sand, watching wave action either way. 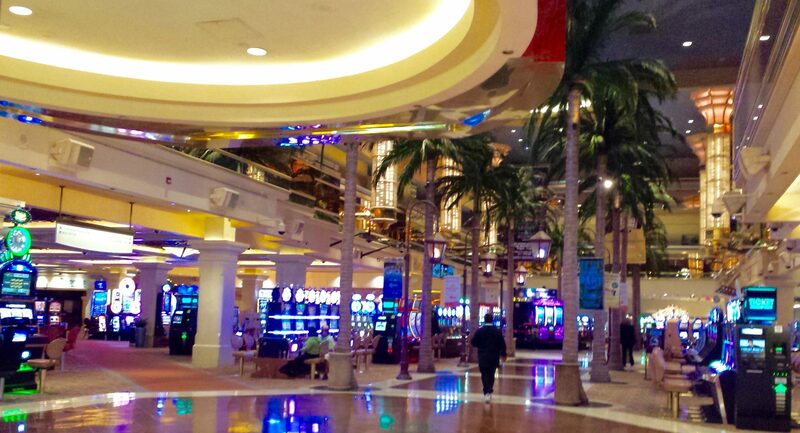 From penny slots to the “top of the trop” for black card members only, the game is on 24/7. Nightclubs range from tame easy listening music to wild, strictly adult but not in your face card slapping like the Vegas strip. It is free of the sleazy element. There is even a kid friendly evening light show, every half hour on the boardwalk. It is not a Hong Kong laser experience but a nice relaxing freebie. Golf entertainment is by no means secondary in AC. 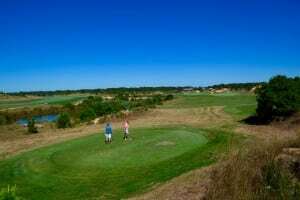 Take the Stockton Seaview Hotel and Golf for example. 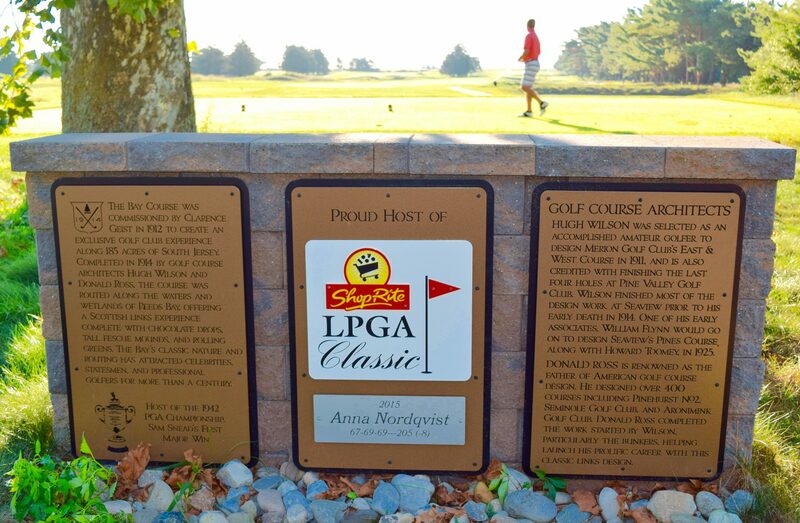 This is the site of the LPGA ShopRite with two courses, Pines and Bay, managed by Troon Golf. Before number 3 on the Bay course, a Troon photo site is positioned for selfies to be taken over the marsh with the bay and cityscape as the Sea view. Peepers and crickets serenade on the golf stroll along the seaside marsh in May. The fairways are not too long for the gals but on the narrow side. Since 1914, golfers have enjoyed these links. 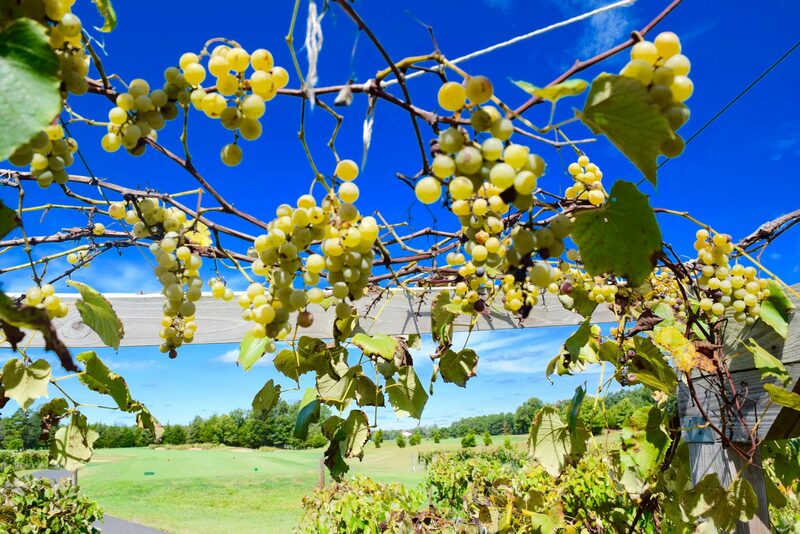 The Renault Winery Resort and Golf in Egg Harbor City, is twenty minutes outside of AC. It is a favorite of world travelers and Ocean City, NJ golfers who unlike in their dry town may order real golf beverages from the cart gal with trendy blue hair to match her Antigua shirt. 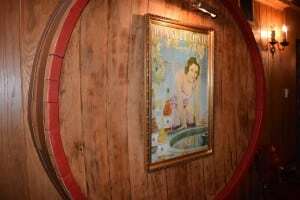 Walk through the Bootlegger alley of the Renault Winery and you get a flavor of the wine and history. Joseph Louis Renault came in the 1850s from France due to an epidemic of aphids to which US vines were resilient. Egg Harbor City had 100 wineries in the day. One of them was owned by Schuster, grandfather to our tour guide Melissa who wrote a 80-page thesis on John D’Agostino, who bought Renault in 1919. Jan of ’20 marked the Prohibition but he obtained a government permit for medicinal wine. It was called Renault Tonic and marketed as a cure all snake oil, fortified with 22% alcohol. The “medicinal” peptone fell to the bottom when cold and so they adhered a warning label, ”Don’t refrigerate or it will turn to wine which is illegal.” Hint, hint, wink, wink. It was purchased over the counter and billed as the fountain of youth by Ziegfield’s showgirl Flossie. As the story goes, after the St. Valentine’s Massacre, Flossie threw an apple at Al Jolsen who ducked and it hit none other than Al Capone who chased them both but racketeer Nucky Johnson intervened on her behalf and later they were wed and introduced to her poster position at Renault. When John D passed, his sister Maria ran the winery till ‘68 when she was 98 endorsing the fountain of youth theory or at least making us all feel better that yes, wine is good for us. 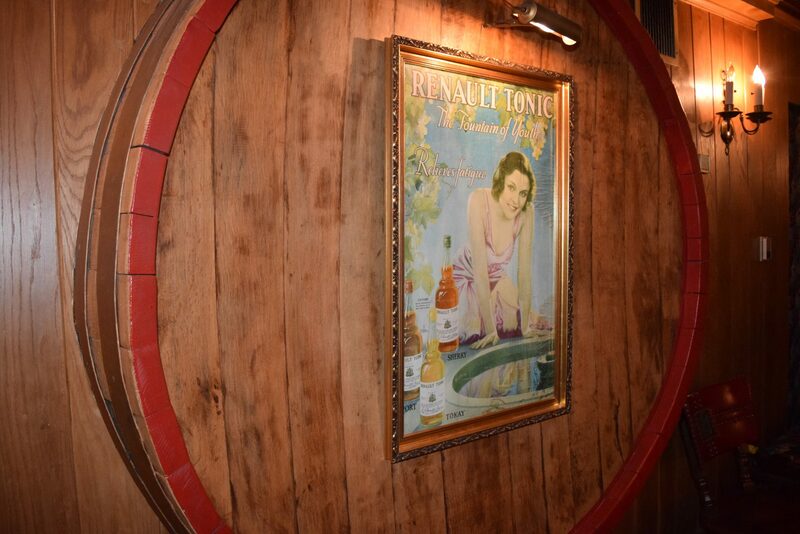 Among the Renault Winery artifacts are the larger oak barrels that could only be cleaned by a child climbing in and after scrubbing would light a sulfur candle and usually pass out, precisely why they tied a rope around their waist, so they could be pulled out to safety. Enter child labor laws. 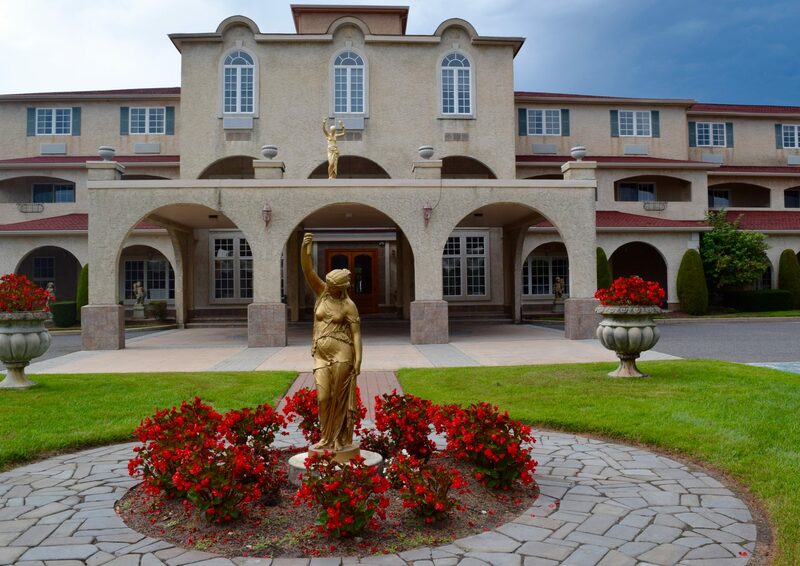 The tour concludes in the tasting room where our favorite was the Champagne served at the Sunday Brunch – a $25 spread in the Tuscan buffet oval, a carving station and specialties from the kitchen like eggs benedict with pork or pina colada pancakes. Mimosas are made to order with said champagne for $3, why not? Locals love Joseph’s Restaurant for dinner and another opportunity to sample the wines. The Renault’s Tuscany House rooms are very spacious for stay and play at The Vineyard Golf Course, which meanders through pines by ponds and along the vines, passing under a grape arbor past the 7th tee box. 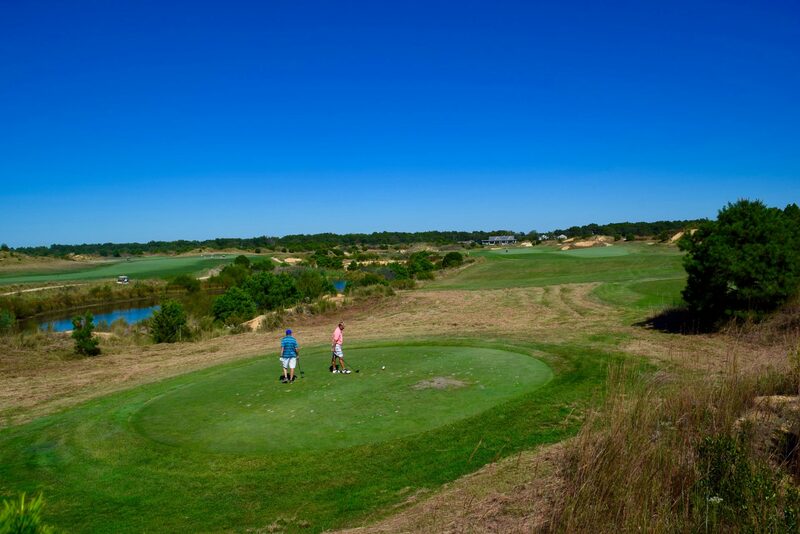 It is generally wide open with two tier greens, a run that reinforces the essence of a good marriage – wine and golf. Tuscany, Italy is ideal for that but Tuscan modeled Renault is closer and the history is as old as any on our continent. John was on a Vineyard par 3, representing Golf Magazine’s “The Challenge.” Pay $10 for a chance to land within a grip, and win a trip plus other prizes. We saw him a few days later at Twisted Dune for another chance. Each hole at Twisted Dune is named after a horse. It appeared a couple might be buried under the greens, like #5. The sky above may have a twist to it as all types of aircraft fly over to a national aviation-testing center. Bombers, copters, you name it, mostly unmanned, land on a nearby styrofoam style runway built for impact analysis. Twisted Dune is full of sand as you might imagine, an odd, fun course but if you want a beer, bring it with you. They’ll provide the cooler with ice. The forward tee advantage is considerable, from 7248 tips to 4930 reds, so ladies place your bets. A new friend, Jim Hogan joined us. 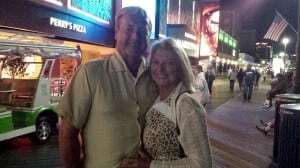 Jim used to own the ice cream parlor in the Tropicana and his wife is still an exec with Caesars. He was born and raised in Duck Town of AC and says he was the only one that looked Irish at the time. His uncle was a controller for the city until his throat was slit in the prohibition days. AC may still be slighted with a bad rap for mob history and casino closings, even though times have changed. Larry Sieg, the Director of Marketing for the Casino Reinvestment Development Authority is tirelessly passionate about bringing AC back to glory day tourism status and is succeeding very well. When we met him at the delicious Dock’s Oyster House, he was just taking a breath after the Miss America Pageant, and soon to be ramping up for Ricky Martin and Madonna’s engagements. He is proud of the recent beach concert that brought in 65k with no incidents, no arrests, just fun. There is music at every turn in AC and a commitment to continue with firsts. They are reinventing the wheel, literally – the Observation Wheel will be a giant Ferris Wheel, with fully enclosed spacious cars for a 30 minute viewing ride. Think cocktail party in a new round. They’ll have to serve hi balls since AC is where they were invented. Have a hi ball or anything you want at Dock’s along with the finest oysters of course and seafood selections as good or better than we’ve had anywhere. The wasabi-crusted tuna is to die for. It will be closed however for six months as they expand next door. Business is booming there as well as the owners’ Knife and Fork, a triangular building seen in every NJ based movie. Both are exquisite and warrant the higher prices.